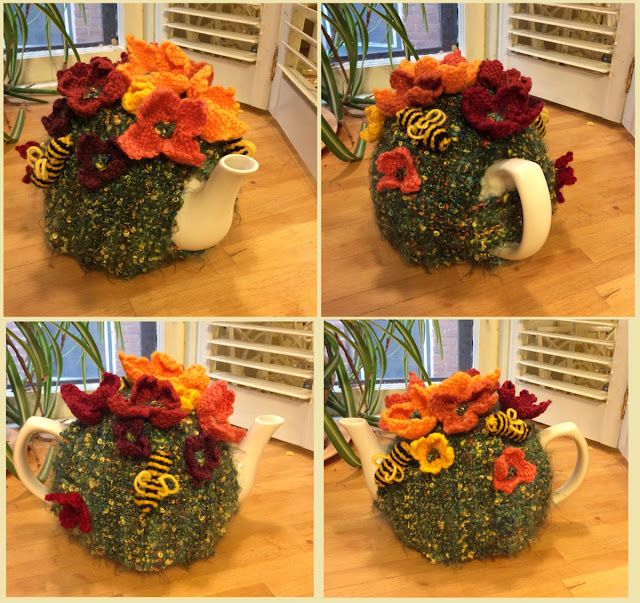 The tea cozy has been established as its own art form for many years, starting, I believe, at about the same time that the British picked up tea cup and knitting needles. 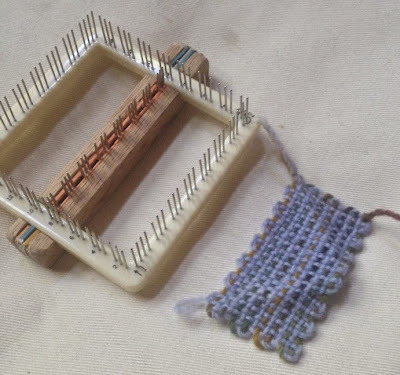 I was convinced that pin looms could be used to make a great tea cozy but I've been too busy writing out patterns for the second pin loom weaving book to prove it. 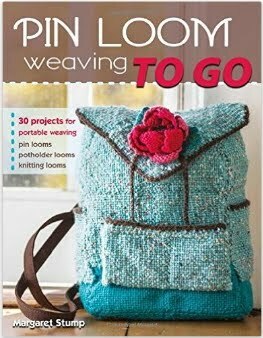 Now that the book has finally been sent off to Stackpole Publishing, the tea cozy weaving project jumped to the top of my "to do" list. I really like the cozies that are knitted or crocheted to look like a basket of flowers or a garden. My intention was to make one that would look like a garden, with flowers scattered on green lawn, complete with buzzing bees. I wasn't worried about the flowers because Jana Trent, of Eloomination fame, has given us the simplest, most graceful approach ever to making flowers with the Loom Bloom concept. I was concerned that since pin looms are all about the square, that I wouldn't be able to make it fit the round tea pot.But it all worked beautifully and turned out to be quite a bit easier than I expected. Here's an overview of the approach used. 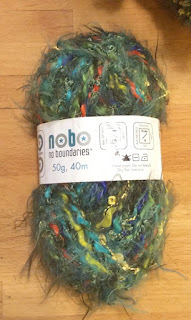 They were woven with a very soft, scarf yarn by NOBO, a mix of nylon, rayon, acrylic and mohair. I wound the NOBO yarn on the pin loom, then used a smooth matching green worsted wool yarn to weave through. 6) 3 x 3" squares in yellow, orange, coral, red and dark red. The 3 bees were made using 3 squares of yellow and black yarn woven on a 2 x 2" loom. I sewed the two 4.5 x 7.5" rectangles on each side of the 4.5 x 4.5" square, so they dropped like a curtain on each side of the tea pot. I added a 2" strip below the spout, leaving a hole for the spout to stick through and added a 2" strip to the back, running through it the handle and sewing it on one side. The other side is attached around a flower with a crocheted loop at the end of the 2" strip. 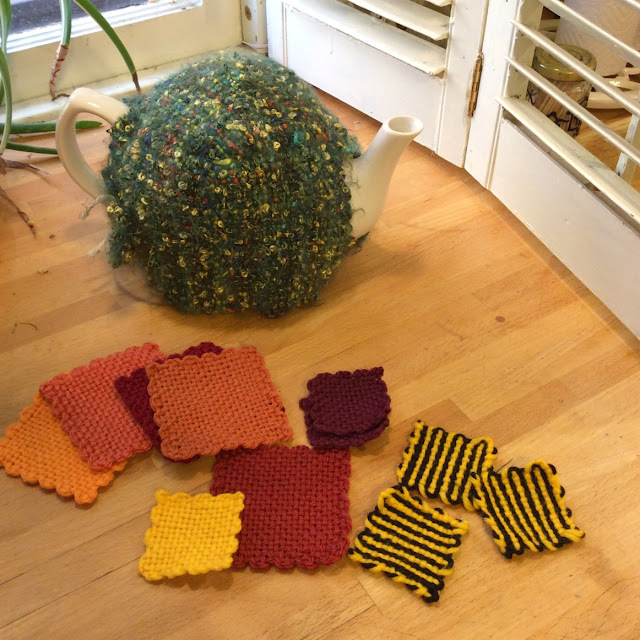 This tea cozy pattern could be reproduced using any size pin loom. Weave a square to be placed over the lid. 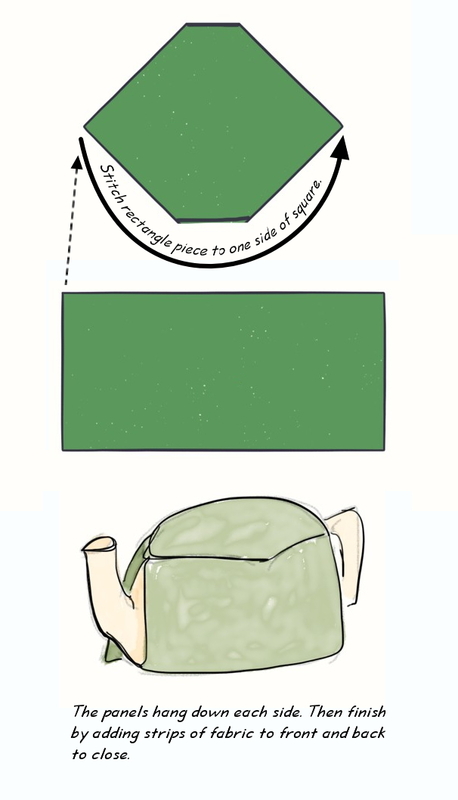 Measure the distance from the edge of the square to the bottom of the tea pot, measure the distance from the spout to the handle. You now have the dimensions for each side of the tea cozy. Weave and join the squares to that approximate size. 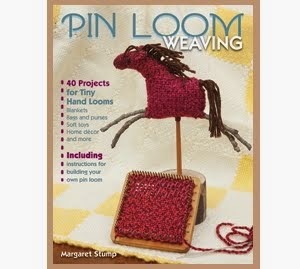 See the information on joining HERE in Pin Loom Essentials. I decided to keep the flowers on the small side, and wove them on 2" and 3" looms. You could just as easily weave all the flowers on the standard 4" pin loom. To make the flowers, start by weaving the squares. Then pull on the middle vertical and horizontal threads of the square in order to make the square pucker in, turning it into a flower. Sew the flowers to the background material in green yarn, stitching the flowers in place and embellishing the middle. This would also be a nice place to add some buttons. If you're going to have flowers in a garden, you need to have bees. The bees are made by winding black yarn on a 2" loom for two layers, then winding on yellow yarn and weaving with yellow yarn. You now have a striped square. Fold it in half, sew and turn inside out in order to make a little black and white striped tube. Stuff the tube and close it off to make a bee. 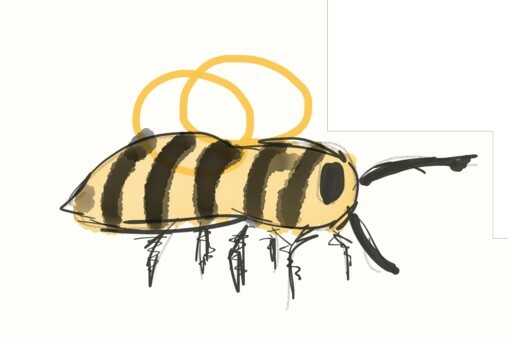 Add several loops of yellow yarn to make the bee's wings. Caroline Fylpaa, the pin loom weaver and pin loom maker of Prairie Points fame (see the original post HERE) was kind enough to send a picture of her finished blanket. Caroline noted that her Grandmother's Nine Patch with Prairie Points did well at the Beltrami City Fair and was then accepted for the Minnesota State Fair. 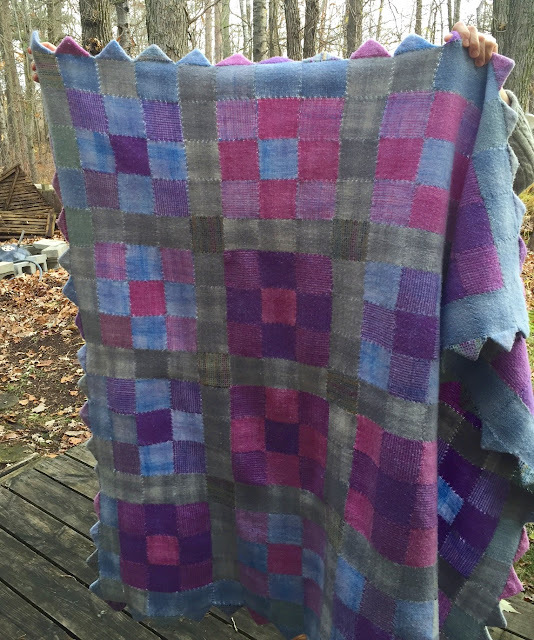 Caroline reported that this blanket was woven in a 70/30 Targhee wool and nylon sock yarn from Montana, "beautiful and lofty." 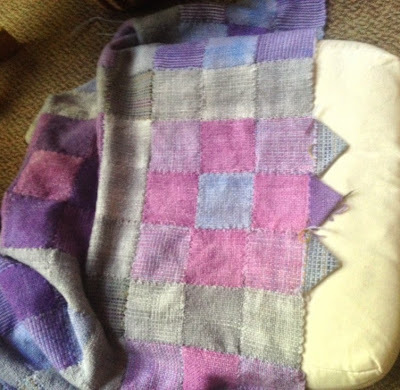 "Plus I always full a weaving project, it smooths things out... similar to blocking after knitting." It would have been cool to get to see Caroline peeking out from behind her creation, but I sympathize with the idea of preferring to be represented by one's work. This blanket has finally convinced me of just how well a sock yarn works on a pin loom. The blanket came a long way from her beginning squares, with a 2x4" square constructed for each prairie point, woven with her own, handcrafted, adjustable weaving bar.